Where have I been............in rip-out realms.........it has been very frustrating! 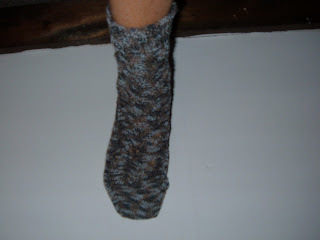 I can usually knit anywhere, anytime but that did not work for this second sock of waving lace pattern! 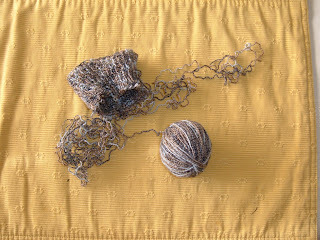 The pattern is wonderful, the yarn is delightful in color and feel, the brain and fingers are not focused and it shows. 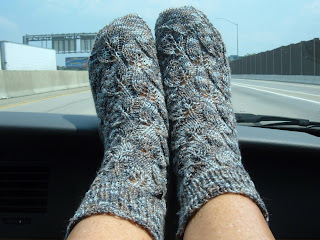 I knit this while in the car and was doing the lace pattern from memory and I am no longer as good at hearing and thinking at the same time anymore.......most of the sock I ripped out was done on an hour and half car trip and then when visiting. It didn't work, okay. I will sit in near silence tonight and knit and hopefully regain the lost and lost-again rows. 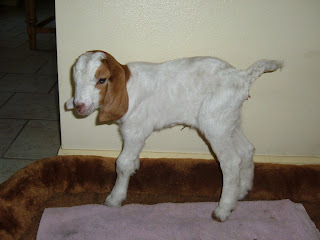 An update on my namesake goat-she is doing wonderfully and has been upgraded from the nursery stall with her mom into the herd! She looks so cute and energetic--I am secretly marking her for some good spinning fluff next year! 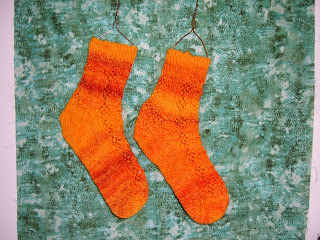 Finished the second sock-aren't they enough to brighten your spirits! They feel delicious to wear...the lace pattern for this pair is from Favorite Socks, it is called the Anniversary Sock which is a very elegant city looking sock and mine are definitely the casual cousin! Spent an afternoon in the sewing room for a change! 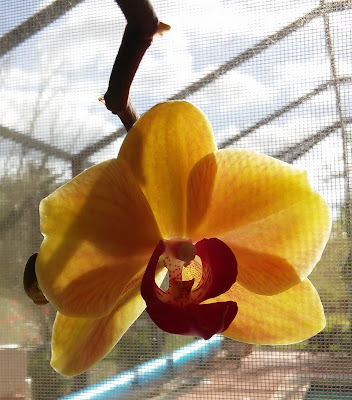 When friends have a new grand-daughter you are inspired to make a 'welcome gift". 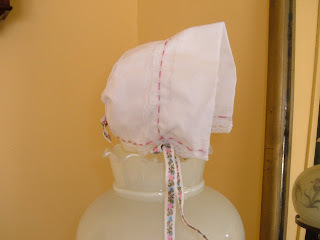 This is a project that uses heirloom sewing techniques to make a hankerchief that then is folded and ingeneously sewn into a bonnet for use by the newborn....then tucked away and brought out to be used by the grown-up daughter as a hanky when she is a bride! 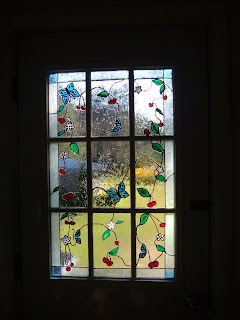 It is a old idea and not mine--I first learned how to make it from a Martha Pullen show, I believe. Bill and I do manage to enjoy each other's company! While covering the long miles of the trip home we get silly, get grouchy, hungry and needful of a Rest Area.....we smile a lot , discuss solutions to the world-at-large and reflect on the lives of our children and where they are in their lives ( I don't mean geographically either!) and generally just appreciate the life in which God has blessed us. It is good to have such a block of time to spend together. 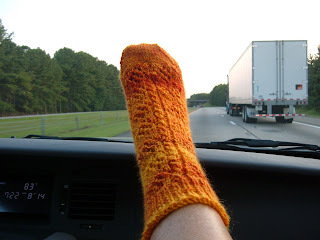 I am usually knitting while Bill does all the driving...here is the first sock I finished -the yarn is not yet spun for the second so the next day of travel I started a pair for David from some left over yarn I had packed. It is good to be home, too. Fond memories to all our Skin-Friends who have had to become Screen-Friends again ........until our next visit. 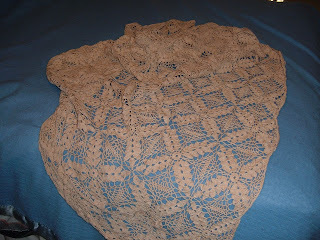 we tea dyed a crochet tablecloth because she noticed it had different colored thread after it was sewn together! 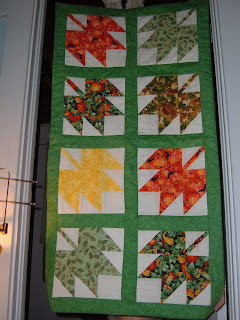 We even managed to sew a quilted wall hanging for her entry way -she is getting out the Fall decorations since it is just around the corner for her! And we knitted and watched craft shows on tv...for an unplanned trip, we managed to make memories of the trip that will last quite a while! Thanks Dad and Mom for the hospitality and love! 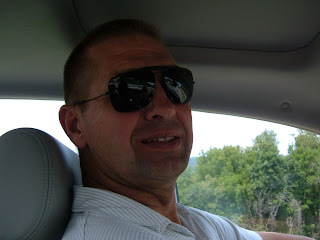 Heading North (1200 miles by car) to pay our respects to a wonderful man who lost his battle with cancer. Our neighbor graciously agreeed to care for our animals and away we went. We experienced happy and sad mixed together-saying goodbye to a good friend and being able to visit friends we haven't seen in 8 months since the move South. 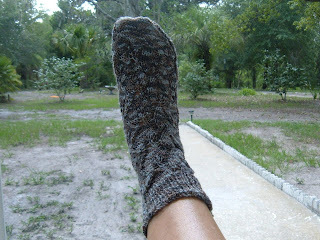 Finished knitting the Granite Socks (Embossed Leaves socks from the Favorite Socks KAL) on the way north. Glad I ripped the first sock out-this one fits perfectly and because it is tighter it shows off the lace pattern the way it is supposed to. 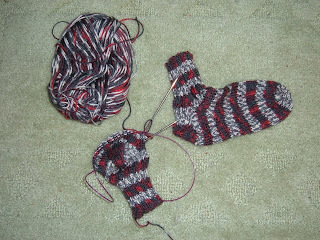 I am making good progress on the second, second sock-a memorized pattern sure works faster! I will be on the road tomorrow , so it will be finished soon. I would like to answer a comment question-what do you knit in the south that doesn't have to be sent north because it is too heavy for here? 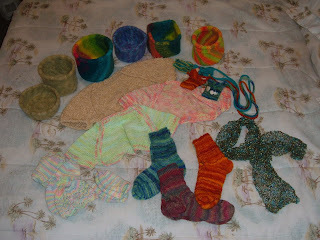 In the 7 months we have been in Florida, I have enjoyed knitting and fulling bowls (14), knitting shrugs (10)to give those shoulders some protection from the A/C, cellphone/i-pod holders (4), hand spun wool for socks(4), accessory scarves (1) , and not pictured-a sweater set for new baby. And yes, some things went north like shrugs, socks, vests and sweaters for the grand kids and newborn hats (36) that go to Community General Hospital in Syracuse. So, Jess, the southern knitter needs to answer this question, do I knit sweaters for my children because I can't find any in the stores........or do I need to knit 'cuz I need to knit. Do I need to feel the yarn slip through my fingers, do I need to see how that color will develop, how that pattern will accomplish that; need to see how the same item in a different yarn is completely new and amazing!? Today we have an incredible selection of yarns to chose from so the southern knitter isn't limited to the heavy wool of outdoor sweaters-bamboo, soy, corn, silk, and tencel-on their own or even blended with merino all make lightweight, ideal for the southern (or anywhere sometime) knitter! Today, I have no limits to what I have available especially because I have the Internet right at my fingertips! 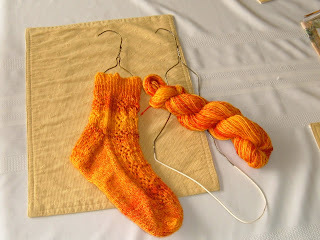 My LYS is more than an hour away from me-but any fiber, any time is just a click away! What a great time to be a southern knitter.........hope this encourages you-have a good day-knit today!